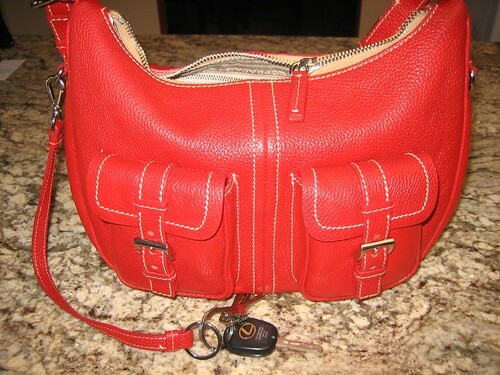 When I bought this red Prada hobo last year, I received a great key leash. I only recently started using it and have found it so handy for those of us who like to carry (and fill!) a large bag. 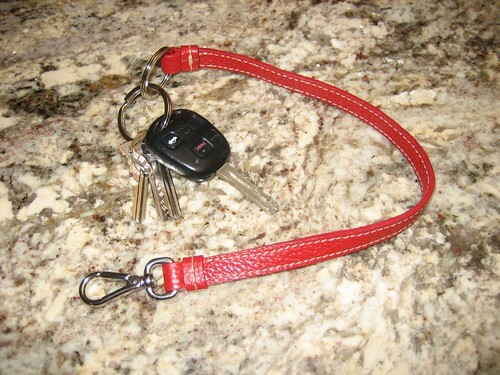 This particular leash is longer than most – about 13″ without the hardware. I really like the length because I can lock up without unhooking the leash. It also allows me to loop it around handles of totes (with the keys dangling inside) or loop it around my wrist if I’m just dashing into the dry cleaners or grocery store. 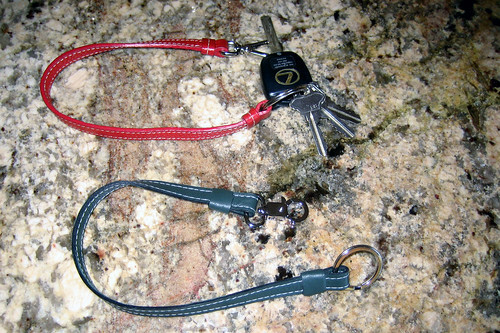 Happily, many bags today already come with an interior ring designed for a key leash (who knows why the Prada ring is on the outside – I would never do it that way!) 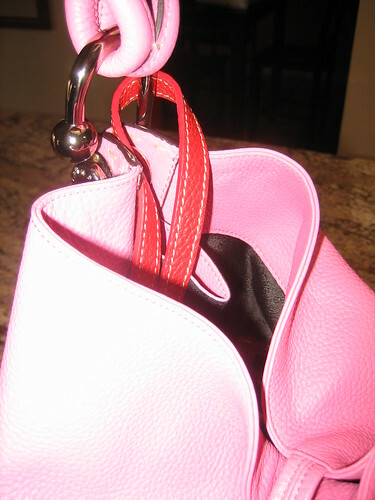 or you can add one to your home sewn bags. Making your own leash is easy as I will demonstrate here. First, I selected a scrap of leather in the desired length, cut two strips and glued them together with my favorite Tandy leather cement. This cement is available at Tandy stores or at Michael’s. 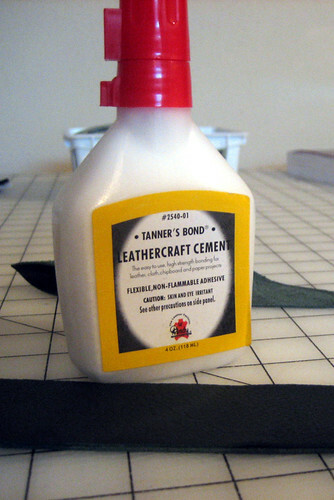 You can also use contact cement or other glues designed for leather (like Sobo). You’ll also need to reserve a couple of smaller pieces – about 2″ long – for finishing the ends. Once the cement dries, simply use your rotary cutter to cut a 1/2″ wide strap. 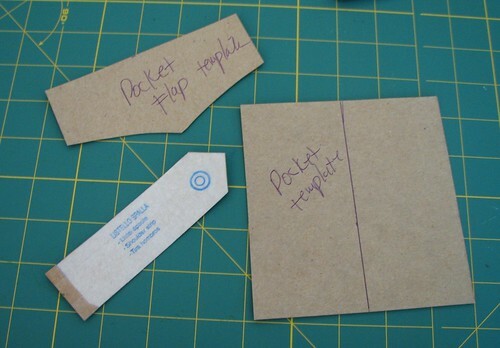 This is infinitely easier than trying to evenly glue two 1/2″ wide pieces together. 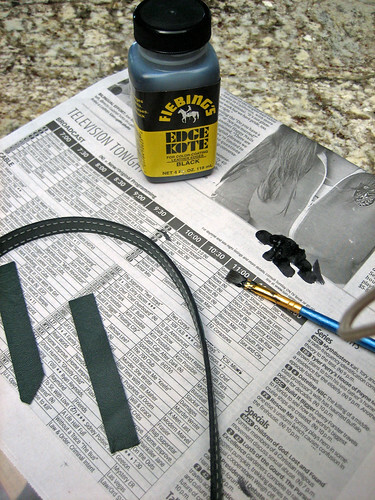 Cut two 2″ long and 1/2″ wide strips from your single layer of leather. I topstitched my long strap but didn’t bother doing so on the short pieces. Next comes edge finishing: I really love Fiebing’s Edge Kote to give the edges a more finished look. You can purchase Edge Kote at Tandy or online, it is available in black and brown (I sure wish they’d add more colors). Someone suggested to me that acrylic craft paint would also work but I haven’t tried it yet so I don’t know how durable it is. Simply take a small paint brush and carefully coat the edges. Allow to dry. 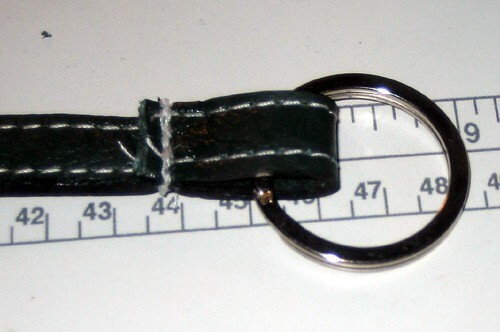 Then, I simply added the ring and hook to the ends and secured them with machine stitching. 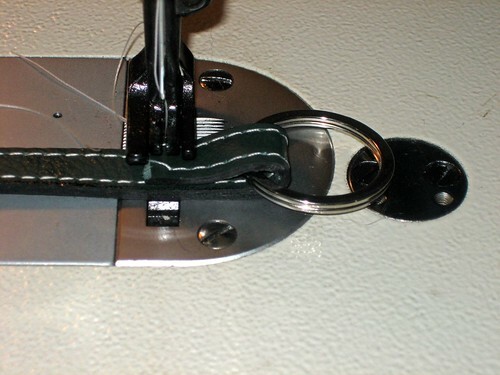 This stitching is really important – you don’t want to lose your keys! 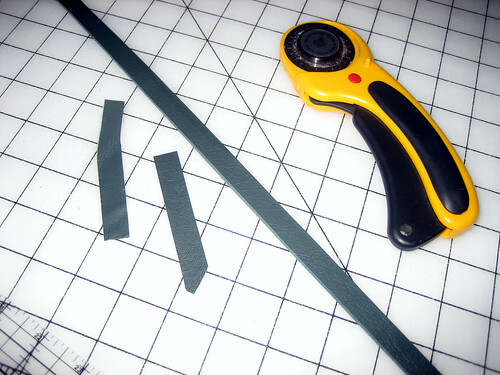 Cover the raw edges with your single layer strips, cutting them to length. 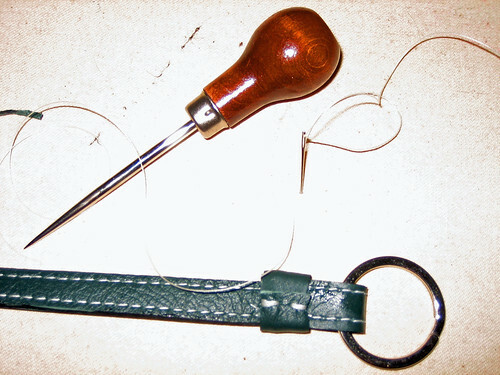 Secure with handstitching poking small holes with your awl first. To make sure the finishing strips wouldn’t slide off I added a few drops of leather cement. That shiny stuff you see on the leather is just a little oil from my machine – oops! That’s it, you’re done! A leash to rival the pricey original. PS: I used an industrial walking foot machine for this project. 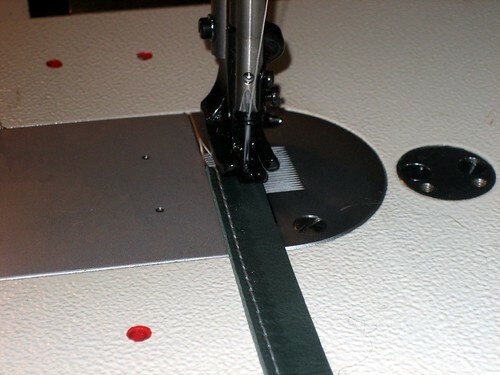 If your machine will not handle the thickness of the leather you can omit the decorative edgestitching (although most machines can easily handle those two layers) and then securely handstitch the ends with heavy thread (don’t forget to use an awl to make handsewing easier) or secure with a rivet. 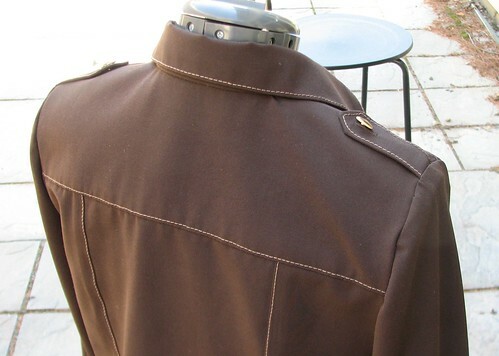 I’m happy with the way this shirt jacket turned out – even though Marfy is pretty much an Outward Bound sewing experience, the patterns are expertly cut and they fit together beautifully. When I do tailored shirts like this, I turn into the Template Queen. Years ago I learned the hard way that the only way I can really replicate the crisp look of RTW shirt details is to use templates. I just can’t rely soley on my eyes and hands for neat and tidy details. The cardboard for these came from the back of a legal pad The big payoff with a template is nice crisp pressed edge for details such as patch pockets. The only other tools you need are a piece of silk organza to use as a press cloth and some spray adhesive to hold the template to the wrong side of the fabric (spray the template, not the fabric.) The template/fabric sandwich is placed right side down on a big piece of silk organza. Grab the silk organaza and use it to pull the fabric over the edge of the template as you press down the edge with a hot iron and lots of steam. Let the pressed piece cool completely and remove the template. Another thing I do with a collar stand is to mark the stitching line all along the curve of the stand at center front – it’s just impossible to rely solely on my seam guide and still get a perfectly curved edge. If I mark the seam line there’s no guesswork. 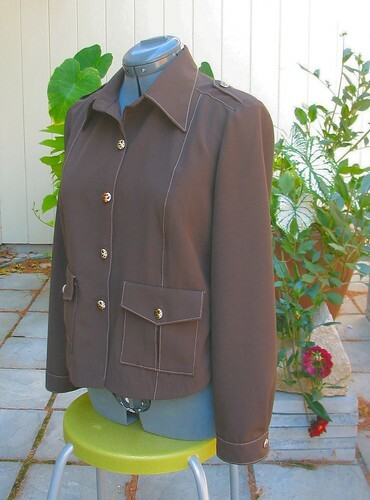 This is a 46 and when I orderd the pattern I used a Burda WOF size table to help me decide, and I erred on the small side. Still, after I did a muslin it was clear I had to narrow the shoulders a full 1/2 inch on each side – I do have narrow shoulders but over all the shoulder and back width seems large to me: 16 1/2 inches across the shoulders. 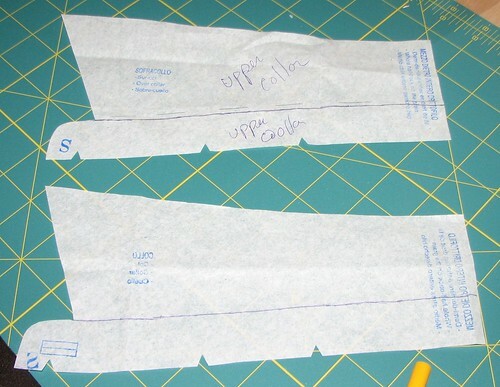 I also shortend the waist a solid 2 inches and the sleeves 3/4 of an inch. The back was let out 2 inches below the hips and no adjustments had to be made for the front hip area. The patch pockets were moved down a bit so they don’t hit me right at the waist. 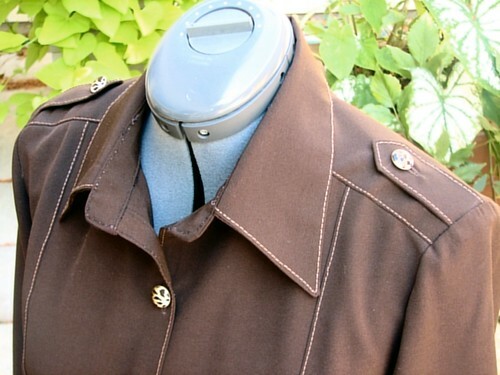 The fabric is a Rayon Poly Stretch twill from Gorgeous Fabrics. So – on to another Marfy! My Fall/Winter 2007-08 catalog just arrived, and inspiration abounds.